Monica Z. Utsey, age 36, is wife, mother and freelance writer in Washington, D.C. She homeschools Zion, age 4, her only son. Monica is also the president of the Southern DC Chapter of Mocha Moms, Inc. Monica is a foreign language enthusiast and is currently learning along with Zion Spanish and Swahili. Monica is fluent in Sign Language. I love the way that unschooling and life overlap. Just the other day my son and I were putting away some of Zion's toys. We have them organized in colorful bins from Ikea. However, once you stack the bins on top of each other, you cannot see the toys inside. I noticed that my husband had taped a photograph of a dinosaur on the outside of the bin that stored Zion's collection, which gave me an idea. Why not label all of the bins with photographs? My husband is an amateur photographer. As a result Zion has learned to love taking photos because he's always watching dad record the memories of our lives. So we decided to borrow my husband's brand new and very expensive Nikon camera. What started out as "clean up time" actually began the process of Zion learning how to set up a scene with his toys, find the proper background, and focus a camera. Before we photographed the toys, we tried to create something elaborate with the toy if we could. For example, Zion made a martial arts character with his Kinnex Sticks and an orange fire truck with his plastic building blocks. He stacked his play dough containers and insisted on being in this picture. 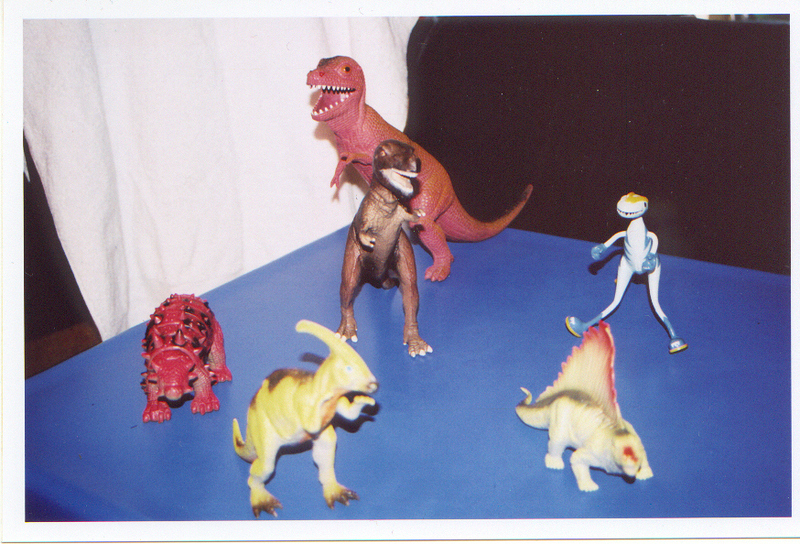 The most elaborate scene was set for the dinosaur collection. He handpicked and named the dinosaurs he wanted in this photograph: tyrannosaurus rex, triceratops, and the duck-billed dinosaur. (The night before we lined up his collection and used an Usborne dinosaur book to match the toy dinosaur with the picture in the book). We learned so much and had so much fun. We sorted, counted, and grouped toys according to size and category. More importantly, we learned that a camera could be used to help organize a house. I did explain to Zion that he should not operate the camera without adult supervision. But I am most proud that my 4-year-old knows how to operate a 35mm camera. It's important to me that we find ways to learn that are relevant to our life and have meaning for Zion. Since he loves taking pictures our next project will be to create our own scrapbook calendar using the camera, and in the process, we'll learn the months of the year. For example, both of his maternal grandmother's birthdays are in March. I'll have Zion take a photograph of his grandmother and great-grandmother. We'll use stencils to draw the letters for March. Then we'll decorate a scrapbook page with photos of grandma and decorations relating to spring. We'll do the same for the month of April; only the photos will be of mommy and his paternal grandmother. By the time we are done, Zion will have photographed his entire family and learned the months of the year at the same time. None of this would have been possible if I was of the mindset that a 4-year-old shouldn't be handling a camera. When the whole world is your classroom, pretty much nothing is off limits! Dinasour scene, set up and photographed by Zion using a Nikon N65 35 mm camera.